Based on the idea of utilizing emotion as an architectural driver, the Temple of Distortion explores ideas of distortion to evoke laughter. 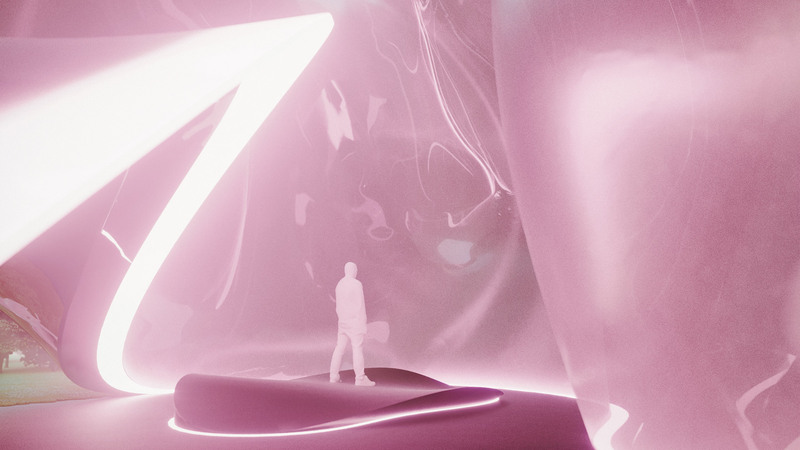 Following the design principles of scared spaces the temple is designed to evoke a sense of infinity through reflection. 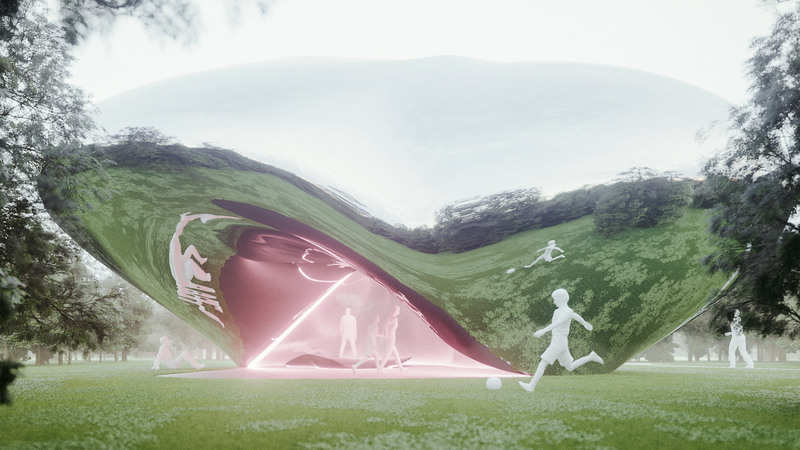 Inspired by the architectural qualities of fun houses the space and observing people interact with their own distorted reflections in the body panels of cars, the space was designed to use these qualities to evoke laughter. Set in a small residential park adjacent to an elementary school it was designed for young children as well as adults. The temple offers various levels of interaction and interpretation based on the mindset of the viewer in the moment. 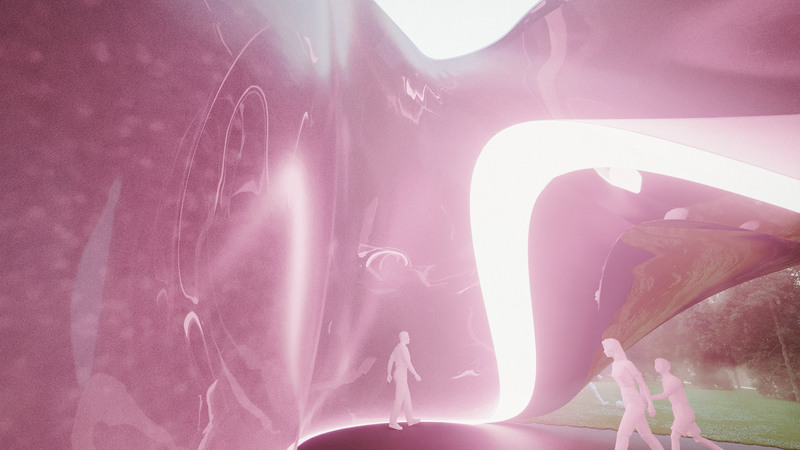 Fundamental concepts from the design of scared spaces were reinterpreted and abstracted to create an amorphous space that would evoke the same phenomenological effects. The final destination could be interpreted as a centre, alter or shrine. The journey is the procession into the defined sacred space. Lastly, the architectural elements are sculptural forms, manipulated through the use of repetition and architectural scale. The journey and destination are two core features for designing scared spaces that were key factors in this project. The journey in scared terms can be referred to as a procession. In this project it is a journey of discovery, as the structure is visible from all sides but may only be entered from one point. People must explore the structure to find their way into it. The destination in sacred spaces is often signified by its center, an altar or a shrine. 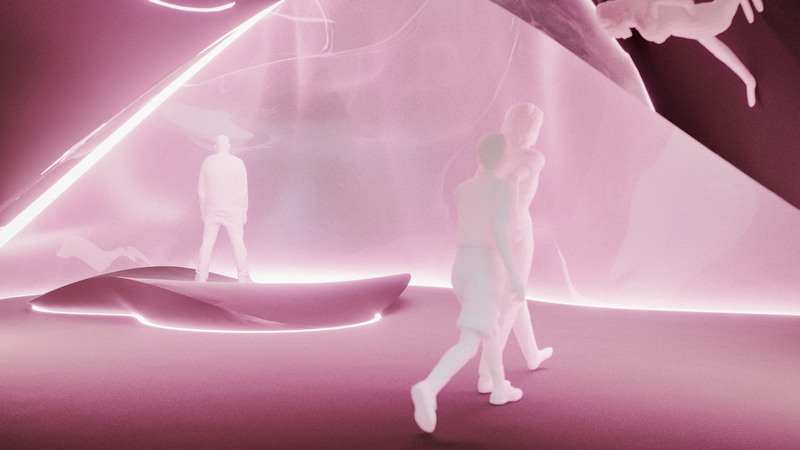 In this temple, there is an altar which places a viewer in a position that allows their reflection to be cast and distorted in multiple places along the surface. 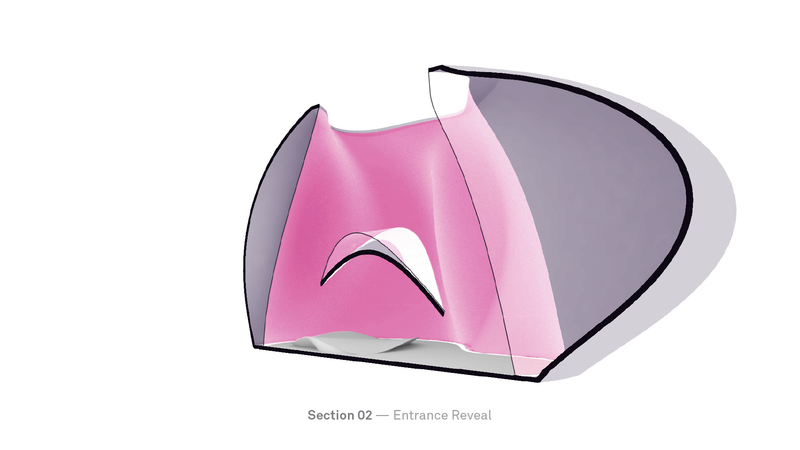 Placed under a central aperture in the top the altar is exposed to the elements, changing the viewer's experience as environmental conditions shift. 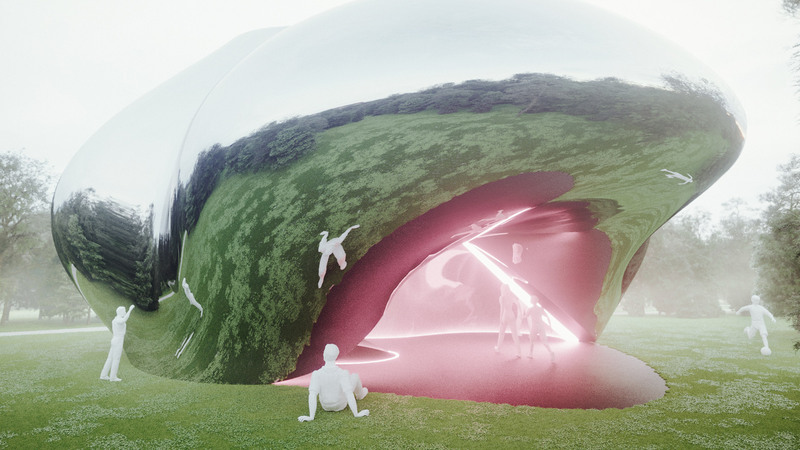 The structure is composed of two core amorphous, undulating, surfaces which are tied together by a band of light. 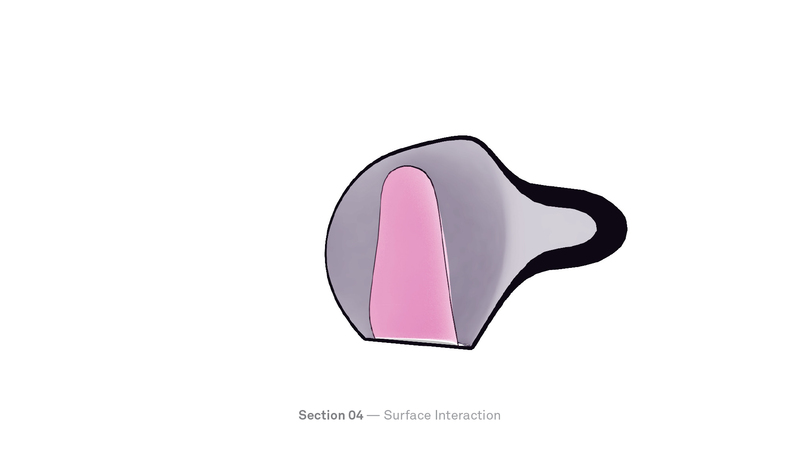 These two surfaces express the core features of the space. 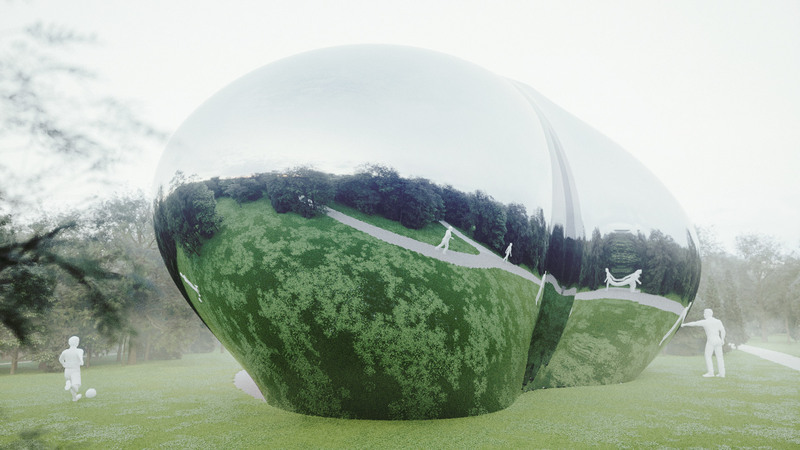 The exterior surface is highly reflective and when seen in situ seems like an other-wordly object that has embedded itself into the landscape. 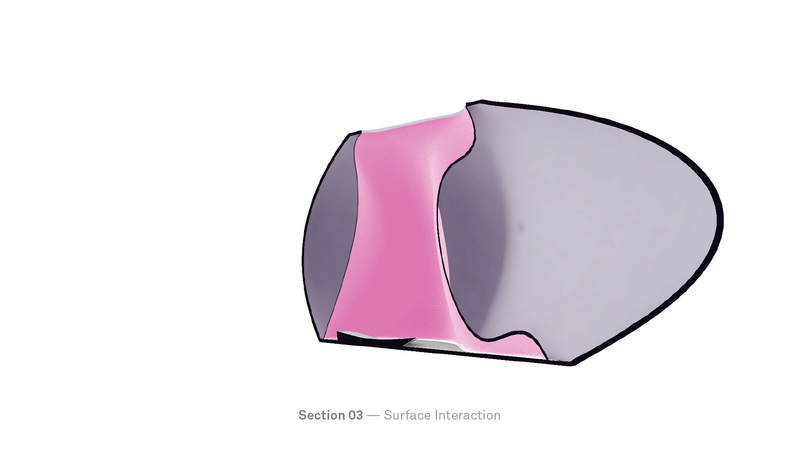 The curvature of this surface reflects the surrounding environment while distorting it. The interior surface is translucent, allowing the reflection of the back of the exterior surface show through. 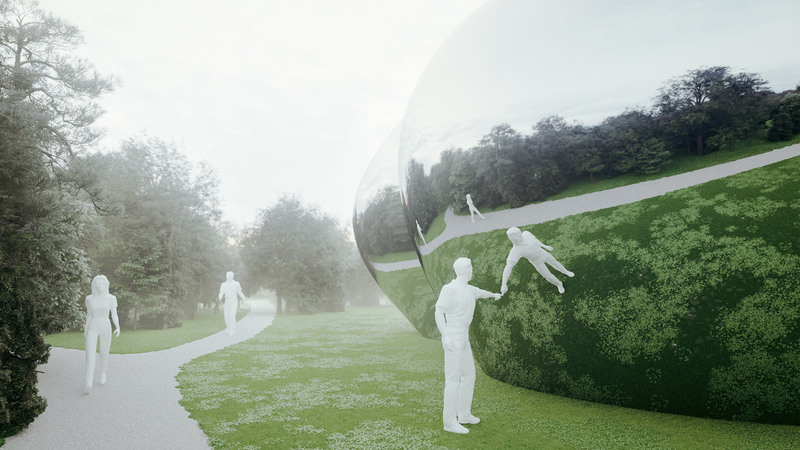 This interior reflection distorts objects within the space in multiple different places throughout the interior volume. 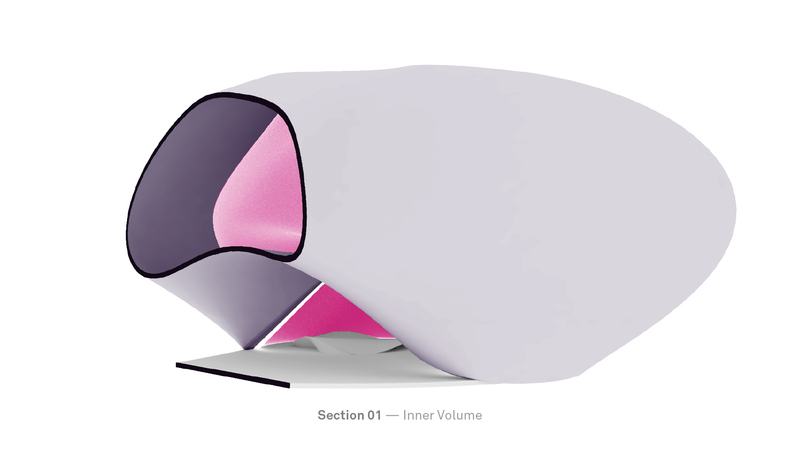 The interior and exterior surfaces were designed as two individual volumes that would interact with each other creating volumetric sensory experiences. As the two move apart from each other the light falloff from the light strip and the skylight fade into the depths of the surface. This depth creates areas of darkness where distorted reflections fade into infinity. The height of the space is based on precedent from sacred spaces that seek to impart a sense of grandeur. The monumental scale and cavernous volume work in tandem to evoke ideas of sacredness. Creating a space that at a glance seems playful and light, but upon deeper reading reveals subtle connections to a sacred space.